Every time an AC current is flowing through a conductor it “transmits” the frequency just like a radio antenna would using the wires it is flowing on as an antenna. This conductor is acting like an antenna and if not properly designed your new antenna may interfere with everything nearby. The closer your wire to a ground wire the better because the ability to transmit depends on the area formed between the current carrying conductor and ground. This is what causes your television to go a bit fuzzy when someone is shaving or using a vacuum cleaner. This will also occur if the cables you run in a facility to connect one machine to another are not properly grounded. Interference is typically a wire or cable issue but can also become an enclosure issue as a PCB will broadcast items as well as a wire can especially if it is not designed properly. Other terms you should be aware of are Radio Frequency Interference (RFI) and Electromagnetic Compatability (EMC). RFI is the same as EMI and EMC is the study of electronic devices working in proximity to one another with a specific focus on the EMI created and received by the electronic systems. When it comes to a wire acting as an antenna, the wavelenth of the signal is important. Wavelength is the speed of light (c=300,000,000 m/s or 3Mm/s) divided by the frequency (f). The wavelength is the spatial distance of one cycle or the length along a wire between peaks in the wave. If the cable is 25% of the wavelength there is a high potential of transmission. However, a rule of thumb that I have used is if the cable is longer than 5% of the wavelength then something must be used to combat the transmission of the frequency. If the frequency of the signal being sent is 600kHz then the wavelength is 500 meters and 5% of 500 is 25 meters. In practice often the cable run length in the design phase is not known so methods are often specified on the drawings. Another factor is the current level of the signal; the more current the more likelihood of unwanted transmission. 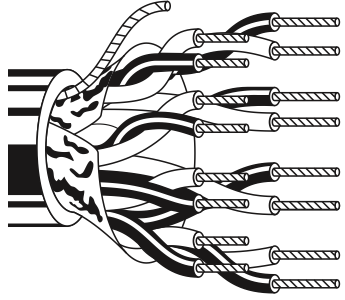 A motor power cable using Pulse Width Modulation (PWM) at several hundred kilohertz will absolutely cause problems. Therefore DC motor cabling (if PWM speed control is used) should always be shielded. Consider the wavelength of your computer running at 3GHz! The wavelength is 0.1 meter, an antenna designed (1/4 wavelength) to transmit this frequency is only about 25mm! One other issue is the type of signal. If it is a sine wave all is as above. However, if it is a square wave as it would be with PWM, then all is out the window! A square wave is actually a combination of many different sine waves at different frequencies, trust me on this, you don’t want to see the math! Because of this, a square wave has extremely high frequencies above those of the main frequency. Here’s a simple simulation of the creation of a square wave using high frequency sine waves together. Another side of the picture must also be considered, the frequency of your cable may not be transmitting through your conductors but what if other cables are transmitting and your cable receives the unwanted interference? Due to this side of the coin methods to combat EMI on a communication cable is almost always specified regardless of the length. There are several ways to combat this problem when it comes to wiring an industrial machine. 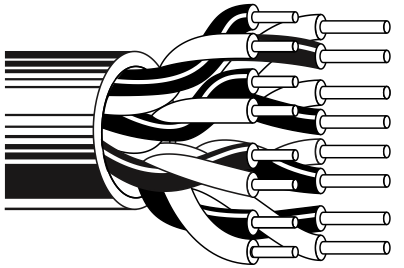 The first and most common is the twisted pair. The twisted pair is a way of saying that each signal wire is twisted with a ground wire its entire length. This minimizes the area between the signal and ground and therefore reduces your electromagnetic emissions. Just above the twisted pair is the foil shield with a drain wire running alongside the shield. This is often combined with the twisted pair. The drain wire is connected to the foil the entire length of the cable and to ground at each end. At the highest end of the spectrum is the braided wire shielding on top of the foil and combined with the twisted pair wire. The above isn’t a commercial for Belden cable just that I have used a lot of Belden cable and that is were I continue to turn for industrial cable. Each of these has advantages along with a range of associated cost increases. Of course these methods can all be used by themselves with differing success. There are other methods of creating more electromagnetically compatible systems with cable some included inside the wire as those above and others as a part of a cable installation. Two common ways are using grounded conduit (many times conduit is not used only from electromagnetic compatibility but to keep the cables safe from their surroundings) and filtering. Many times the frequencies that are being transmitted aren’t needed but are a side effect of the system and can be filtered out before being sent through the cable. Likewise, the signal can also be filtered when they are received to eliminate unwanted frequencies. As you can imagine it is difficult to insure that all different kinds of electronic systems will work alongside one another if they aren’t tested together. Many times there is no substitution for connecting the systems and testing, but to eliminate many problems there are certifications that product developers can obtain to insure their users that their system will not generate above a certain level of EMI and will tolerate a certain level of EMI. Three common certifications are the IC, CE, and the FCC certifications. These certifications specify levels that equipment can emit and receive and remain under certification. Most typically product designers will hire specialized companies to insure that the certifications are met before they pay for the certification company to run the tests and issue the certification. These certification documents read like a legal document and can be very time consuming and intimidating to determine exactly what hoops you and your product must jump through to meet certifications. The CE mark is one mark that must be obtained on any product sold in much of Europe. 1. Given a wire length, two factors that affect the ability of a wire to transmit unwanted EMI are ________ . 2. EMC stands for _______________. 3. RFI stands for _______________. 4. What is 5% of the wavelength of a sinewave signal at 350kHz? 5. Three methods for protecting a conductor from transmitting unwanted EMI are _______.